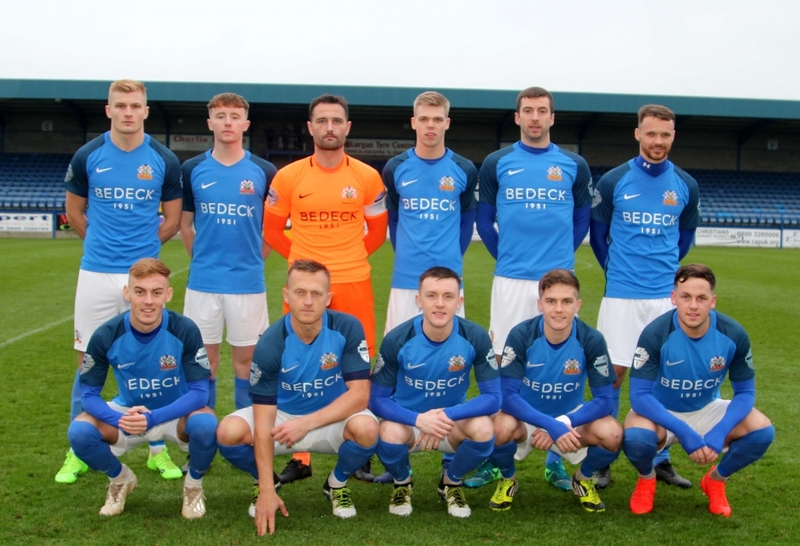 Glenavon came from behind twice to draw 3 – 3 with Institute in a pulsating match at Mourneview Park on Saturday. 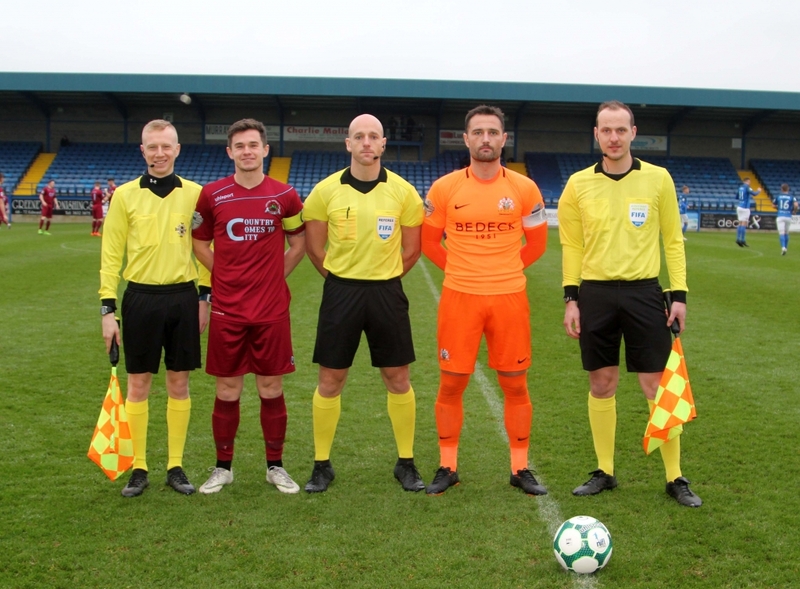 Leading scorer Stephen Murray opened the scoring for the Lurgan Blues in the sixth minute, but Institute equalised just two minutes later through Joe McCready, then went in front on 24 minutes when Mark Scoltock headed in from a free-kick. Glenavon equalised in the 36th minute when Andrew Mitchell finished off a slick move to leave the half-time score 2 – 2. Institute took the lead for a second time when captain Michael McCrudden struck 10 minutes into the second period following a counter attack, and it looked like the visitors were going to hold on for a famous victory until substitute Conor McCloskey struck three minutes from time to rescue a point for the Lurgan Blues. The game was open from the get-go, with both sides displaying their attacking intent in the opening minutes, and it was no surprise to see two early goals. It was the home side who opened the scoring. Mitchell had an excellent game for Glenavon, and he produced a moment of real quality to set up his strike partner Murray. Rhys Marshall fed the ball into Mitchell’s feet, and with his back to goal and Caoimhin Bonner pressuring him, Mitchell took one touch to turn, then slid a delicate little through ball into the penalty area with the outside of his left foot for Murray to run on to. 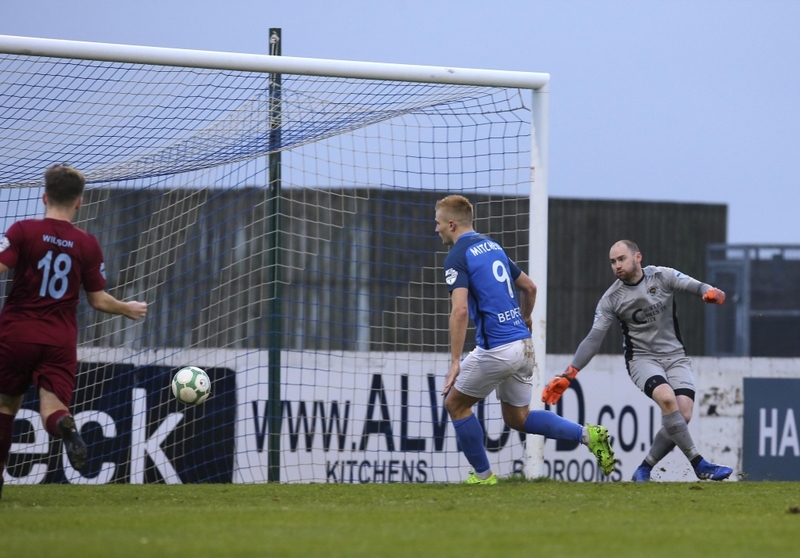 Murray beat onrushing goalkeeper Martin Gallagher to the ball and slipped it past him with his left foot to give Glenavon the lead. However, the hosts were ahead for just two minutes. 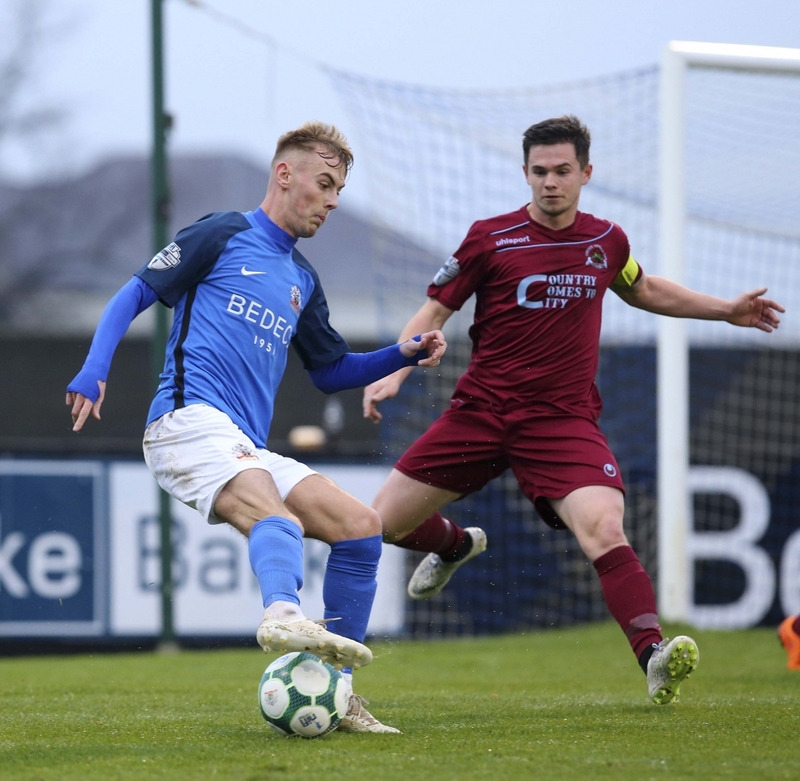 After Marshall had got himself into difficulties, Stute trio McCrudden, Ronan Doherty and Aaron Harkin put together a neat move on the left flank which led to McCrudden delivering a low cross into the penalty area with his left foot. Caolan Marron really should have cleared the ball, and in failing to do so he allowed it to find its way to Harkin. The midfielder pulled it back for McCready and the big striker had the simple task of slotting in from eight yards. 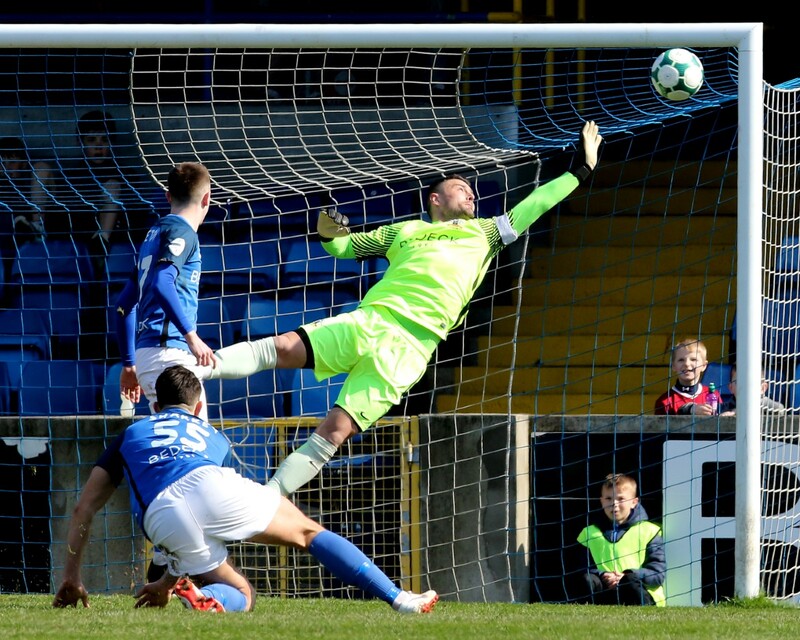 Glenavon really should have drawn level less than five minutes later when Mitchell picked Murray out with a fantastic cross from close to the left-side touchline, but Murray’s header was straight at Gallagher. Murray looked certain to score again in the 14th minute when he got on the end of a cross from Josh Daniels, but Gallagher denied him once more with an excellent save at the back post. Mitchell produced another good cross on 16 minutes to find Hall, whose header was comfortably saved by Gallagher. In hindsight, the winger might have been better placed to strike the ball on the volley rather than attempt to score with his head. Glenavon were punished for missing those opportunities when Stute took the lead in the 24th minute. 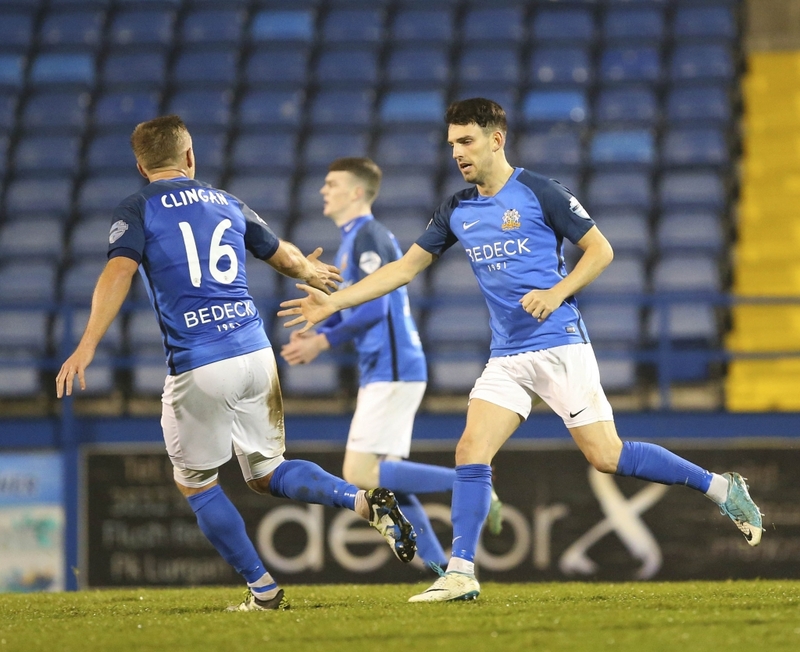 Harkin delivered a free-kick from the right and Glenavon’s marking was very poor, with both Dean Curry and Scoltock left free at the back post. It was the latter who got on the end of the cross, directing his header into the bottom corner past Jonathan Tuffey. Glenavon drew level a little more than 10 minutes later. Daniels switched the play from left to right with a fine long ball to find Marshall. The full-back fed the ball wide to Hall, who returned it with a deft little left-footed pass around Curry which allowed Marshall to surge towards the byline before delivering a low cross into the six-yard box. Mitchell was there to convert with a tap-in and grab his second goal in as many games. 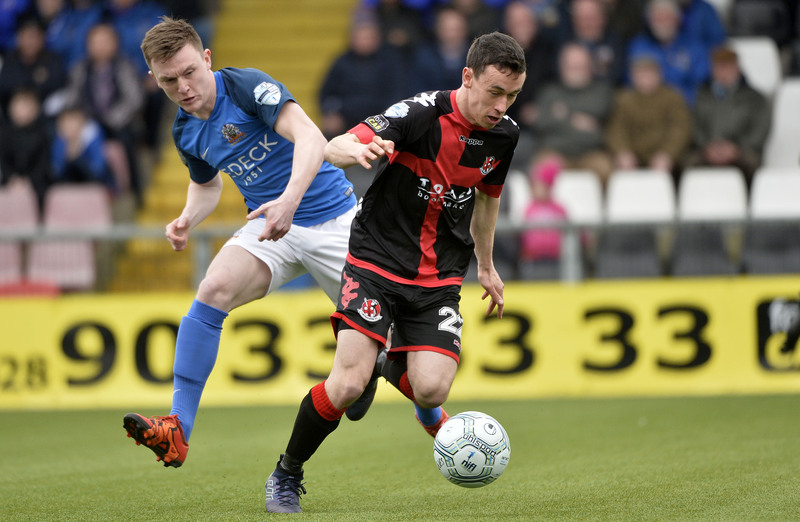 Crusaders boss Stephen Baxter waxed lyrical about Institute after his side narrowly defeated them with a stoppage time penalty the previous week, saying that they were the best visiting side he had seen at Seaview in five seasons. You could see where Baxter was coming from in the early portion of the second half at Mourneview, with the visitors playing some excellent one- and two-touch football to carve their way through Glenavon’s defence on more than one occasion. 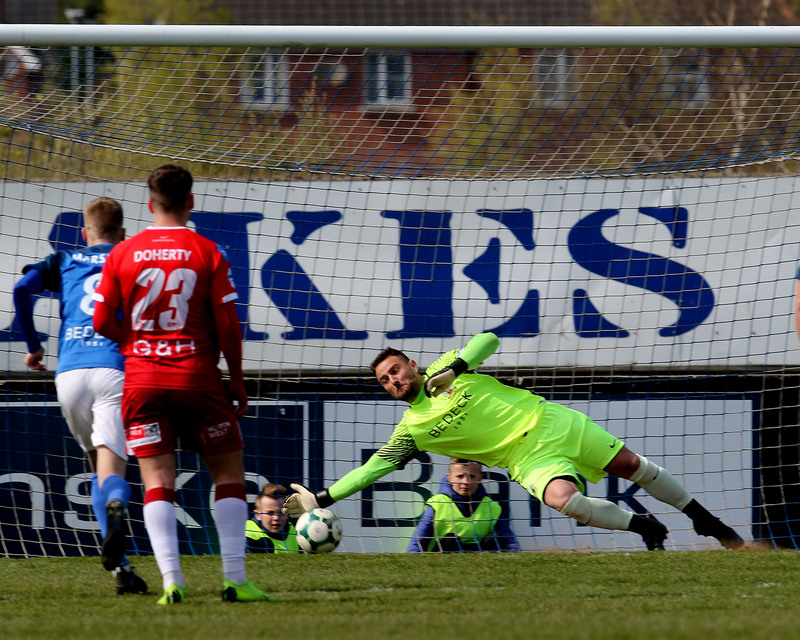 The visitors took the lead again in the 55th minute when they hit Glenavon on the break. McCrudden played a one-two with teammate Doherty before bursting past Glenavon’s Ben Doherty and firing a low shot into the far corner. At this stage Institute threatened to run away with the game. First McCready showed an excellent first touch and burst of pace to get away from Marron and fashion a shooting chance for himself, only to drag his effort wide of Tuffey’s right-hand post. Then Glenavon had Marshall to thank for keeping the deficit at just one goal when he cleared an effort off the line following a corner. Having managed to weather that storm, the tide of the game swung back in favour of the home side and they put Stute under pressure as they went in search of an equaliser. It really should have arrived in the 66th minute when Hall picked Mitchell out with one of his trademark crosses from the right, but the striker got the timing of his jump wrong and sent his header down into the ground and the ball bounced harmlessly over the crossbar. Mark Sykes was presented with an opportunity when he was sent through following a move on the right wing between Murray and substitute McCloskey. Bonner recovered well to get in a blocking tackle, but Sykes’ shot may have been going wide anyway. On 76 minutes Murray managed to turn and get a shot away after he’d been found by Sykes, but Gallagher denied him yet again. 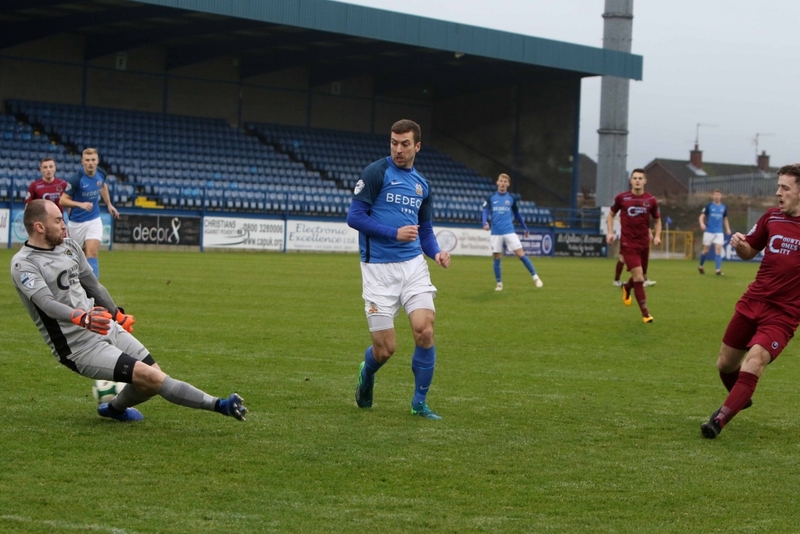 Sammy Clingan did well to get back and deny McCrudden when Institute hit Glenavon on the break in the 80th minute. It looked as though the Lurgan Blues were going to slump to their third defeat in five matches, but McCloskey popped up with the equaliser with just three minutes left on the clock. McCloskey himself sent over a very deep cross from the left wing and Marron and Mitchell did well to keep the ball alive. Marshall scuffed a shot into the turf which skipped up for Jenkins. The young striker didn’t get a clean connection on his overhead kick, but he still succeeded in finding fellow substitute McCloskey at the far post and the winger slammed the ball past Gallagher with his left foot to make it 3 – 3 and rescue a point for the home side. 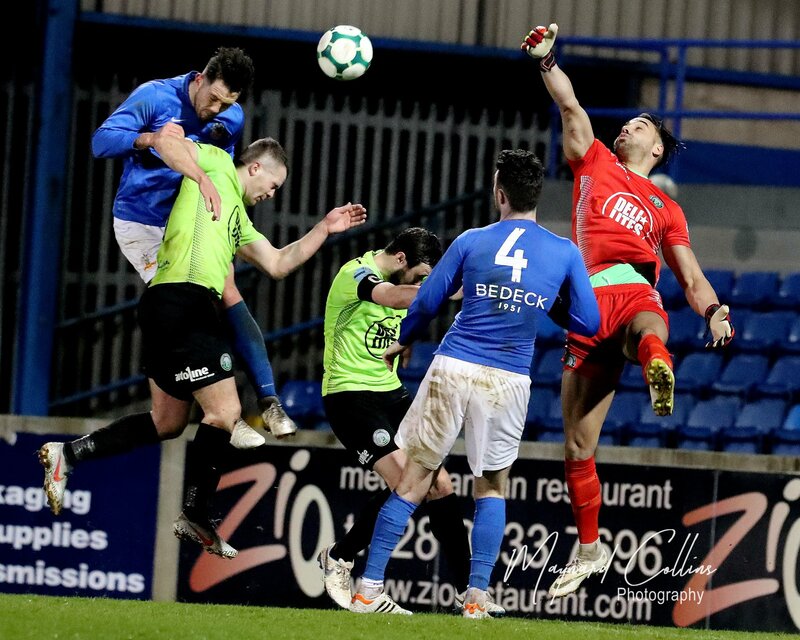 Ballymena defeated Linfield 2 – 1 in the battle of the top two at the Showgrounds on Saturday, so Glenavon remain in third spot, one point behind Linfield and three points behind Ballymena, but still with a game in hand over both teams. 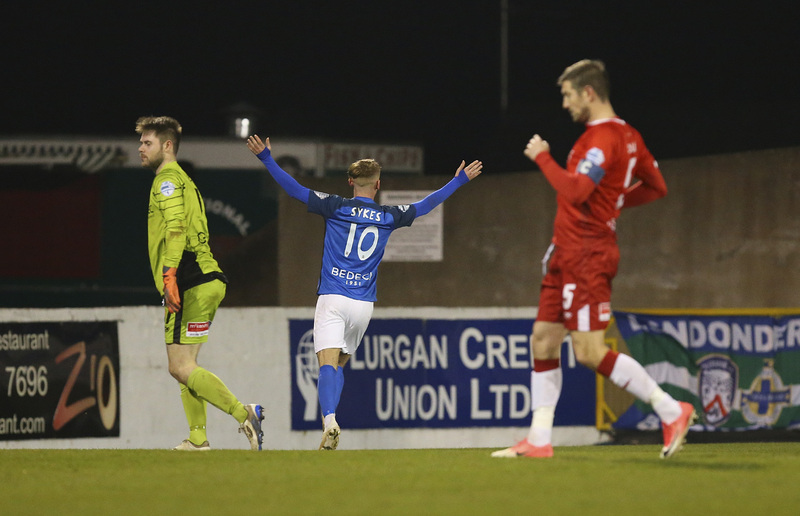 The Lurgan Blues entertain Dungannon Swifts on Tuesday night (December 4th) in the rearranged Mid-Ulster Cup semi-final (kick-off 7.45pm) before travelling to Solitude next Saturday (December 8th) to take on fifth-placed Cliftonville (kick-off 3pm).